Trade shows require not only monetary investment and elbow grease, but a lot of strategic thinking, for the opportunity to #DriveLeads and engage reporters, potential partners and investors in a short amount of time. According to the Center for Exhibition Industry Research, almost 40% of B2B marketing budgets is allocated toward expos and trade shows, the largest amount of money dedicated to any single marketing channel. Why? 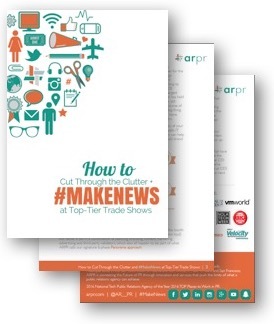 In part because 81% of trade show attendees have buying authority. How do you make the most of your trade show investments and reach these decision makers? "When planning for a large event like a trade show where timelines are tight and there are more moving parts than you can count on your fingers and toes, early planning not only helps you keep your eye on the prize (i.e., lead generation) but also ensures the experience itself is enjoyable…and heck, even fun." As one of the nation’s fastest growing technology PR firms and the 2016 Tech Agency of the Year, ARPR is a results-driven public relations and integrated communications agency helping global leaders and growth-stage technology brands #MakeNews and #DriveLeads.